Sony is reportedly working on an update to its tablet line featuring a speedy processor, full HD display, and a waterproof case. The Sony Xperia Z2 is expected to feature a 10 inch screen, measure just a quarter of an inch thick, and ship with Android 4.4 KitKat software. 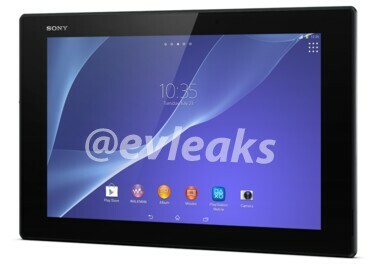 Sony hasn’t officially introduced the new tablet yet, but the details come from fairly reliable leaker @evleaks. The tablet’s said to sport a Qualcomm Snapdragon 800 quad-core processor, a 10.1 inch, 1920 x 1200 pixel Triluminos display, 3GB of RAM, and 16GB of storage. It has a microSD card slot, a 6000mAh battery, an 8MP rear camera, and 2MP front-facing camera. Sony recently announced plans to sell off its PC business, but the company plans to stay in the mobile space and continue to launch new phones and tablets. On paper, the Xperia Z2 looks like it could be a rather attractive new entry. Unfortunately Sony’s past few Android tablets have tended to carry rather high price tags. I think the resolution of 1080p is an weak point. I hope they’re wrong about the size…been loving 8 inch tablets lately.